There's no denying that when it comes to protection and mobility, leather armour is definitely the way to go. A suit of leather armour allows for a warrior to protect their vitals while retaining their agility, and at Medieval Armour, we understand that mobility is sometimes every bit as important as plated protection. And that's why we offer such a wide selection of different pieces of leather armour. Virtually all of our leather armour is crafted from high quality leather, and many pieces are even crafted from armor-grade leather to ensure its strength and its durability. And because of that strength, much of our leather armour works wonderfully as leather SCA armour or leather LARP armour, providing a more than adequate level of protection for any fighter or warrior interested in reenactment or battle. Much of our leather armour is modeled after traditional medieval armour, although there are plenty of pieces of fantasy leather armour for those out there who want a distinctive and unique style fitting their fantasy theme. And of course, we offer various pieces of protection so that they can be mixed and matched, creating a wide assortment of different looks. We have leather arm armour to keep your wrists and arms safe from harm, as well as leather leg armour for keeping others from inflicting damage upon your legs. There's leather neck armour and leather helmets for protecting your vital regions, i.e. your head and your neck, and of course, there's leather body armour to keep core safe from enemy blows. When it comes to leather armour, at Medieval Armour, we don't kid around, offering the widest selection of leather armour and all its pieces possible, all so that you can peruse, purchase and put together your ideal suit of authentic medieval or fantasy leather armour. When you're looking to protect yourself with a combination of fancy footwork and armour, then you should definitely consider wearing leather body armour. Leather armour is lighter and more flexible than metal, giving the wearer that much more room to work with. And when you decide to wear leather armour, you can find the leather cuirass you need here at Medieval Armour. We offer a number of different styles of leather armour, all to suit a wide assortment of different tastes. For the traditional warrior, we offer leather medieval armour that is simple, straight-forward, and to the point. And for the discerning warrior who wants something a bit more unique, we also offer leather fantasy armour that will create the costume look. We even offer Roman lorica segmenta in all leather, as well as classic Roman muscle armour in leather, ensuring that if you want a Grecian or a Roman look in leather, you can have that, too! 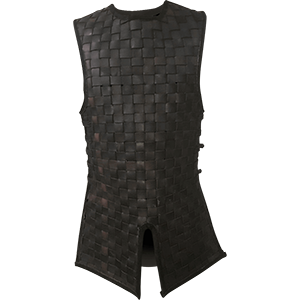 Several pieces of our leather body armour works quite well as SCA armour, as it is made from armor-grade leather that's designed to take punishment quite well. And even if you're not fighting, a good leather cuirass or leather harness is just the way to create a number of impressive looks, ranging from historical warriors like centurions and roman legionaries to fantasy fighters like rangers and elves. And if you're looking for even more protection, nothing complements a leather medieval cuirass quite like a chainmail hauberk. And you can find both and much more in the way of great leather armour, here at Medieval Armour. Like its metal cousins, a leather gorget is more than just a piece of armour. Of course, leather gorgets do provide an added level of defense to the collar, neck, shoulders, and chest, and that alone is a valuable feature. But a leather gorget can also act as a harness, allowing even more defenses to be added to a warrior's defense. 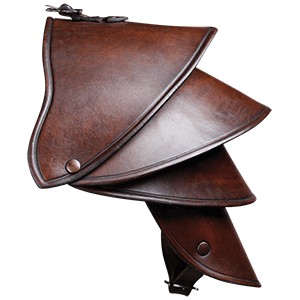 Modeled after the traditional medieval gorget, these pieces of neck protection are worn in a fashion similar to a leather cowl, wrapping around the shoulders and sometimes the neck, providing an additional layer of leather protection. Virtually all of our leather gorgets are solid examples of neck armour and shoulder armour, having been made from quality, armour-grade leather that gives each one the weight and durability necessary to stand up against impact. Because of their strength, they make great SCA gorgets, especially for the warrior whose looking to wear medieval armour that's light in weight. And since they hold up so well under duress, they are fantastic LARP gorgets, too, adding a sense of realism and style to any LARP or LRP warrior's attire. 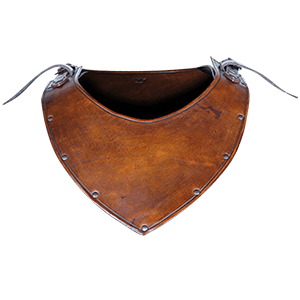 If you're going for absolute realism or if you're just seeking absolute leather protection, you'll want to invest in one of Medieval Armour's leather gorgets, for both the protection it will provide as well as the look. In battle, it is important to protect both your hands and your arms, and there's no better way to protect yourself and retain your mobility than to wear a set of Leather Full Arm Armour. And here at Medieval Armour, we offer not just one or two sets of leather arm armour, but several, allowing any warrior to have their pick of several different styles of quality arm protection. These leather arms are modeled after classic examples of medieval armour, taking traditional designs and transforming them into fully functional pieces of leather armour. 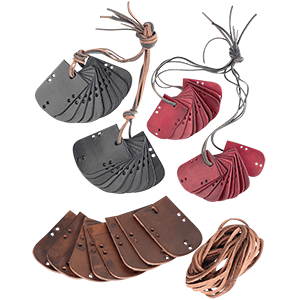 Thanks to their hardy strength, several of the leather arm armour offered here makes great re-enactment armour, as well as great SCA leather arm armour, offering the perfect medium between defensive strength and weight. Because they work so well as SCA arm armour, they also double as fantastic LARP arm armour, providing the same defense against LARP weapons as they would provide against blunted, training weapons. They also come in various styles, ranging from the traditional manica and segmentata of Roman and gladiator-styled armours to the more medieval styles of mercenary arms and Milanese arms, which are perfect for medieval warriors, knights, and bandits of all sorts. Whether you're wearing it as a part of a costume or wearing it into you battle, you won't regret equipping yourself with a good set of leather arm armour from Medieval Armour. At Medieval Armour, we don't just offer a few pieces of protection. No, we pride ourselves on offering as much protective gear as we can. 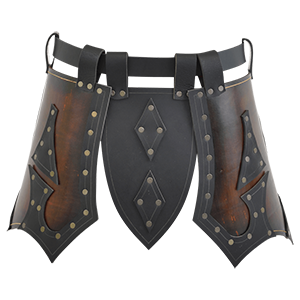 And that means that we're happy to offer you leather thigh armour and leather tassets, along with a number of other examples of fine leather armour that is designed to protect any warrior's thigh and upper leg. During the medieval times, tassets were typically worn to protect the thigh and waist from a downward blow, while the cuisse (which is French for 'thighs') was worn under the tassets and other armours to protect the wearer from upward-striking blows. We offer a selection of leather thigh armour that is designed to protect against one, the other, or both. Some of the leg armour featured here protects only the thighs and upper legs, although a few pieces do provide more coverage for the lower leg, too. Much of our medieval thigh armour is made from high quality 13/15 oz. armor-grade leather, ensuring that it will stand strong through the best of battle. Incidentally, this also makes almost everything you see here in this category a great SCA cuisse, as well as a fantastic LARP cuisse or great reenactment armour in general. 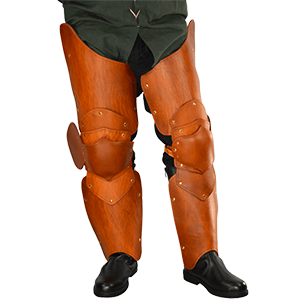 Not only have you found functional armour, but you've also found functional leather thigh armour here at Medieval Armour. And when you wear leather tassets and leather cuisse, you push yourself one step closer towards becoming a heavily armoured warrior just like those figures from history. In the hectic hustle and bustle of battle, it's easy to forget, sometimes, about what ones legs are doing...and how well they're protected. Agility and movement will take you far, but sometimes, it's better to cover all your bases and wear some leather leg armour, which is why Medieval Armour carries an assortment of leather full leg armour fit for any warrior or knight! When it comes to this leather leg armour, we don't mess around. Made from quality 13/15 oz. armour grade leather, these combinations of leather greaves, leather cuisse, and leather knee cops are just what any warrior would want to wear to protect their legs, offering the lightness of leather with a remarkable durability. These sets of medieval leather leg armour are made to last and made to take punishment, coming in various styles to suit a variety of warrior's needs, ranging from knight leg armour to mercenary leg armour and more! And because of its strength, it makes for great reenactment and SCA leg armour, helping to fend off blows from both weighted training weapons and blunted replicas. It goes without saying that defends just as well against LARP weapons, making it great live action roleplay armour, too. Being nimble and agile is a good start to a defense, but sooner or later, an opponent is bound to get lucky. Better, instead, to wear some of the full leather leg armour offered here at Medieval Armour and cover your legs, just in-case, rather than take a needless risk by going into battle only partly armoured. 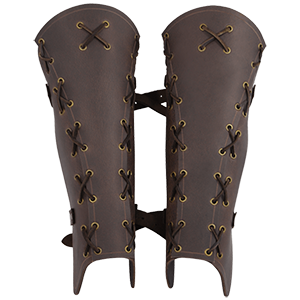 A good pair of leather greaves can save your life, or at least save your skin when it comes to reenactments and mock-battles. 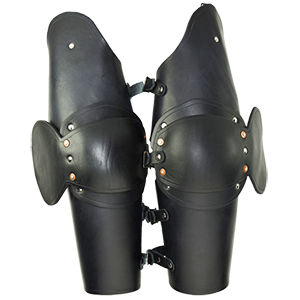 Modeled after traditional medieval greaves, the leather leg armour here at Medieval Armour is aimed at keeping your legs safe in a fight, ensuring that you can focus your attention on the battle at hand, instead of on how well protected you are. Virtually all of our leather greaves, ranging from the plain greaves to the more ornate and fantasy style greaves, are made from quality leather that is designed to stand up to wear, tear, and use, making each one a great LARP leather greave to wear when marching off into battle. 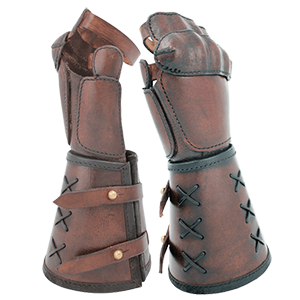 Some are even made from armour-grade leather, making them perfect for use as SCA leather greaves too, where they will provide more than adequate protection against blows and glancing strikes that end up hurtling towards your legs. And we offer a range of different styles, from those modeled after medieval armour like our gladiator greaves and our roman greaves, to those modeled to suit fantasy and style, like our berserker leather greaves, as well as anything in-between the two that will perfectly serve as a set of knights greaves or mercenary greaves. 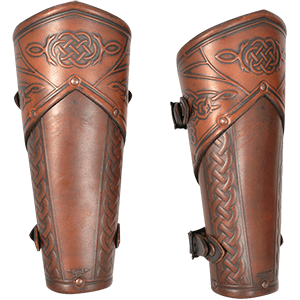 There's no reason to march into battle with your legs unprotected, not when Medieval Armour offers a wide assortment of leather greaves, in a wide range of prices, ensuring that there's a leg protection that suits your needs, and more importantly, your taste. If you're looking for a complete suit of leather body armour and you've found your way here, to Medieval Armour, then you've found the right place. 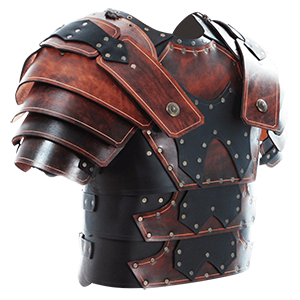 Here, you'll find a number of great leather armour sets, which are not only perfect for keeping you protected behind layers of intimidating leather armour, but are also great for making you look like a true warrior. Each of these leather armour sets contains virtually everything you need to put together a protected look fit for any warrior, whether he was medieval or fantasy. 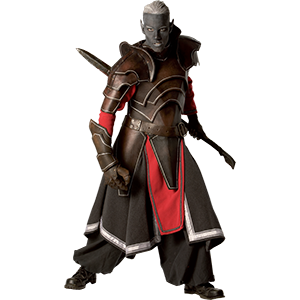 Some of these leather armour packages, like our Dark Elven package and our King package, also include tunics and other garments, which help to complete the total image that the armour package helps to create! Other suits of leather armour contain all the distinctive pieces that typically go into suit of armour, only made entirely of leather! This mean that some sets contain the pauldrons, cuirass, vembraces, and greaves you need to transform yourself into a leather armoured warrior fit for action! Some suits of leather armour found here are suited more for LARP and for reenactments, while others can be ordered in a heavier weight that allows them to be used in SCA events. If you think that putting together your own entire suit of leather armour is too much hassle, then check out this Leather Armour Packages and Leather Armour Sets section of Medieval Armour, where you'll find that we've taken most of the hassle out of putting together your full suit of leather body armour. All you have to do is find the one you like most, fill in whatever holes it might have (if any), and you're done. Throughout history, women have joined men upon the field of battle, showing their skill in the arts of war. At Medieval Armour, we aim to offer a wide selection of high quality leather armour tailored to the female form. Our inventory of female armour includes womens leather breastplates, womens leather skirts, womens leather bracers, womens leather greaves, and so much more. Ideal for LARPing, theatrical performances, and Ren Faires, our womens leather armour offers the perfect combination of protection, light weight material, and comfort for your needs. Our womens armor can help you transform into a warrior of various styles, including medieval lady knights, Viking shield maidens and Valkyries, and fantasy rogues and sorceresses. Check back frequently to discover the latest arrivals in this category and add to your lady warrior look! If you have been thinking of making your own leather armour or embellishing the leather armour you already have, browse through our selection of DIY leather armour pieces. 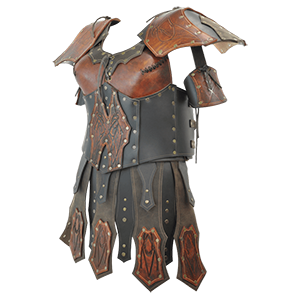 Our leather armour pieces here are intended for creating your own leather armour or for adding on to existing armour, such as for providing extra detail or for repair purposes. We offer leather lamellae plates that are ideal for creating your own leather lamellar plate armour. For all our do-it-yourself leather armour pieces, this is the place to shop. Be sure to keep checking back as we add new pieces whenever they become available.